Solopos.com, SEMARANG – Menteri Pertahanan Purnomo Yusgiantoro mengatakan Mabes TNI AD telah mengajukan tambahan anggaran khusus senilai Rp6 triliun untuk pembelian sejumlah helikopter serang Apache dari Amerika Serikat beserta persenjataannya. ”Pemerintah Amerika Serikat sudah menyetujui pembelian helikopter Apache. Sekarang sedang proses negosiasi harga,” ungkap di Semarang, Sabtu (29/6/2013). Sebab harga satu unit helikopter Apache sangat mahal yakni senilai US$40 juta atau sekitar Rp388 miliar. ”Saat ini tim khusus dari Kementerian Pertahanan dan Mabes TNI AD, sedang melobi pemerintah Amerika Serikat mengenai harga helikopter Apache,” imbuhnya. 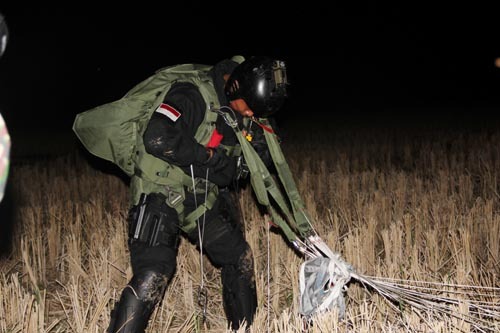 Keberadaan skadron Apache itu, kata Menhan, untuk melengkapi kekuatan militer Indonesia dalam menjaga kedaulatan negara. ”Selain TNI AD, TNI Angkatan Laut juga menyiapkan helikopter antikapal selam dan membuat armada perusak kawal rudal,” ujarnya. China and South Korea will keep pushing to end North Korea’s nuclear program, their leaders declared Thursday at a high-profile summit between Pyongyang’s closest ally and its key rival. “We have agreed that under any circumstances, North Korea’s nuclear (weapons) are unacceptable and confirmed that the denuclearization of the Korean peninsula is of common interest for the two countries,” South Korean President Park Geun-Hye told reporters as she sat beside Chinese President Xi Jinping. Park made the remarks after a summit meeting in Beijing, where Xi greeted her as “an old friend of China” and granted her full military honors before the pair witnessed the signing of trade and other agreements. “We on both sides consistently agree to continue to realise the denuclearization of the Korean peninsula and firmly protect peace and stability on the peninsula,” Xi said, though he avoided singling out North Korea by name. China has previously supported North Korea’s denuclearization and is the chair of a multinational forum — the six-party talks — aimed at achieving it, but has also tended to prioritize regional stability, for decades acting as the sole major ally and economic lifeline to the unpredictable North. South Korea, which does not have nuclear weapons, and ally the United States, have made it clear they will never accept the idea of North Korea as a nuclear state, and insist Pyongyang must show a tangible commitment to abandoning its nuclear weapons if it wants substantive talks. Both have pressured China to use more of its leverage to rein in Pyongyang. Xi, for his part, described the situation on the divided peninsula as “currently changing in a positive direction”, apparently referring to recent offers by Pyongyang to pursue dialogue, including hinting at a return to long-stalled six-nation nuclear talks aimed at shuttering its nuclear program. “We hope all sides can seize this opportunity to work to return to the six party talks as soon as possible,” he said. The forum — which groups North Korea, China, South Korea, Japan, Russia and the United States — is aimed at achieving Pyongyang’s abandonment of its nuclear weapons program in return for aid and security guarantees. The North appears in recent months to have moderated its stance after a series of bellicose statements and gestures against the South and the US early this year, including threats of nuclear war. In February the North carried out its third underground nuclear test in defiance of UN Security Council resolutions, sending tensions soaring and raising fears of possible conflict. While a planned meeting with South Korea earlier this month fell through, Pyongyang has offered direct talks with Washington, and has sent two envoys to Beijing since late May to express a willingness for dialogue. Yang Moo-Jin, a professor at the University of North Korean Studies in Seoul, was cautious about how close the views of Xi and Park on North Korea actually are. “President Xi reaffirmed China’s established stance apparently in consideration of North Korea, while President Park strongly clarified South Korea’s position that North Korea’s nuclear weapons are unacceptable,” Yang told AFP. China’s relationship with North Korea — famously described by Mao Zedong as being as close as “lips and teeth” — was forged in the 1950-53 Korean War which China entered to prevent the North’s total defeat. But it has weakened significantly over the years, as China’s economic transformation has distanced it from the ideological rigidity of the dynastic Kim regime across the border. China’s relations with South Korea got off to a late start with diplomatic relations only established in 1992, but have improved steadily ever since, especially in the economic sphere. In line with UN sanctions, Beijing has moved to restrict Pyongyang’s financial operations in China which the international community says are the major conduit for funding its nuclear weapons program. North Korea was not the only topic on Thursday, with the two sides signing eight agreements in various fields including energy, trade, technology and oceanic cooperation. China is now South Korea’s biggest trade partner and Park has been accompanied on her trip by a sizable business delegation from her country’s dynamic economy. The two countries have been negotiating a free-trade pact. During her stay, Park, who has taught herself some Chinese and expressed an interest in Chinese philosophy, will meet other key officials and also visit the ancient city of Xi’an, according to reports. The US military is reviewing its rules of engagement to deal with the growing threat of cyber crime, military chief Martin Dempsey said Thursday. Dempsey, the Chairman of the Joint Chiefs of Staff, the highest-ranking officer in the US military, said the review was in response to soaring cyber attacks. “The Department of Defense has developed emergency procedures to guide our response to imminent, significant cyber threats,” Dempsey said in a speech at the Brookings Institution, a Washington-based think tank. Some 4,000 cyber-security experts would join the ranks over the next four years, while some $23 billion would be spent on tackling the threat. Dempsey said Cybercom — the US command responsible for combatting cyber-crime — was now organized in three divisions. One team was in charge of countering enemy attacks, another was tasked with offering regional support while a third was responsible for protecting some 15,000 US military computer networks. In addition following a presidential directive, the military now had a manual which allowed it to cooperate with the Department of Homeland Security and the FBI in the event of attacks on civilian networks. Dempsey meanwhile lamented what he described as inadequate safeguards by the private sector. In a reference to concerns over the levels of government surveillance on private individuals since the revelations by leaker Edward Snowden, Dempsey said he believed a balance could be struck. “I understand that the country is debating the proper purpose, and limits, of intelligence collection for national security,” he said. 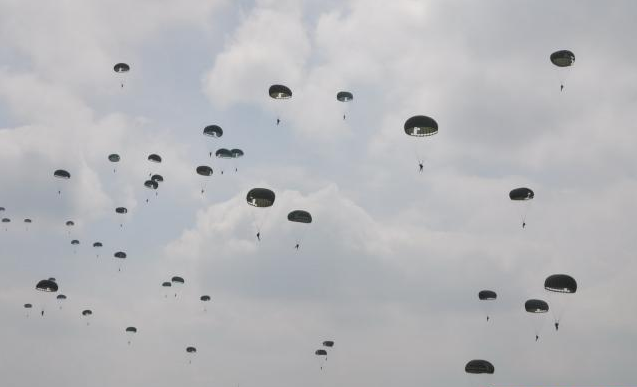 Surabaya (Antara Jatim) – Prajurit Batalyon 464/Paskhas mengikuti Latihan Puncak Korpaskhas bersandi “Trisula Perkasa 2013” yang dipusatkan di wilayah Kupang, Nusa Tenggara Timur, dan Markas Lanud Eltari Kupang. Penerangan Paskhas dari Kupang melaporkan kepada Antara bahwa latihan yang melibatkan ratusan unsur pasukan seluruh jajaran Korpaskhas itu juga melibatkan Batalyon 464 Paskhas yang bermarkas di komplek Lanud Abd. Saleh Malang. 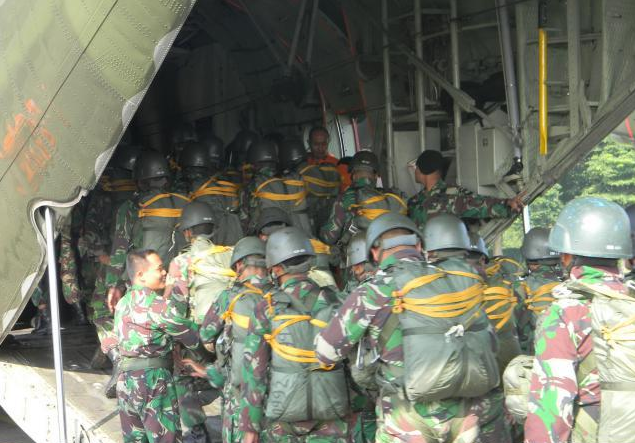 Latihan yang dibuka Dankorpaskhas pada minggu lalu itu juga mengerahkan empat pesawat C-130 Hercules dari Skadron Udara 31 Halim PK, Skadron Udara 32 dari Bandara Abd Saleh Malang, dan satu pesawat CN-295 serta personel Lanud Eltari, Kupang, NTT. Kegiatannya diawali dengan gladi posko yang dipusatkan di Mako Korpaskhas dan sebelumnya telah dilaksanakan penataran pelaku dan wasdal untuk bekal latihan, lalu manuver lapangan dilaksanakan pada 23-28 Juni 2013. Dalam latihan itu, Yon 464 Paskhas melibatkan Tim Dalpur (Pengendali Tempur), Tim Dallan (Pengendali Pangkalan), Tim Jump Master, dan Tim SARPUR (SAR Tempur). Unsur Tim Pengendali Tempur dikomandani langsung oleh Danyon 464 Paskhas, Letkol Pasukan Joko Prasetyo. 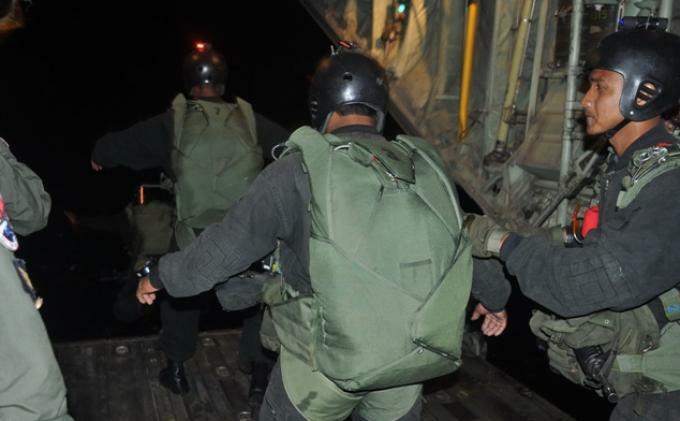 Tim Dalpur melaksanakan infiltrasi melalui udara menuju sasaran terpilih yakni Pangkalan TNI AU Eltari Kupang pada malam hari dengan melakukan penerjunan “free fall” dengan metode HAHO (High Altitude High Opening). Selanjutnya, setelah Tim Pengedali tempur menyatakan aman sasaran tersebut, maka satuan Yonbuthanlan yang diterjunkan melalui terjun statik melakukan operasi perebutan dan pertahanan pangkalan agar pangkalan tersebut siap digunakan operasi selanjutnya. Trisula Perkasa merupakan sandi latihan puncak Korpaskhas yang digelar dalam setiap tahun dan dilaksanakan sebagai manifestasi dari hasil pembinaan yang dilakukan Korpaskhas dan juga merupakan wujud akuntabilitas publik dan pertanggungjawaban Korpaskhas di bidang pembinaan kepada TNI Angkatan Udara, dan kepada Bangsa dan rakyat Indonesia. Latihan bersandi Trisula Perkasa Korpaskhas 2013 itu bertemakan “Satgas Paskhas Melaksanakan Operasi Perebutan dan Pengendalian Pangkalan Udara di Wilayah Indonesia Timur Dalam Rangka Mendukung Tugas Komando Tugas Udara Gabungan”. Sebelumnya (21/6), Pasmar-1 menggelar Latihan Posko-1 Aspek Laut dalam rangka program latihan triwulan III-2013 untuk mewujudkan kesiapsiagaan personel dan operasional. The Army’s top aviation acquisition leader engaged industry members and community leaders on the future of Army aviation during an “Update for Industry” June 18 at The Summit. Maj. Gen. Tim Crosby, program executive officer for aviation, spoke to members of the local chapter of the Association of the U.S. Army, where he emphasized balance, communication and shared resources, and ensuring that Army aviation maintains its relevancy with ground commanders. “The reason our budget has been so stable for so long is that I’ve not needed to fight for it,” Crosby said. Nothing happens in the battlefield in Afghanistan without Army aviation, he said, whether it is to support Soldiers in combat, resupply, route clearance convoys, MEDEVAC support, or other missions. “Our aviators out there today, working hand-in-hand with that ground commander, have established a rapport that has shown the value of Army aviation, and we must maintain that,” Crosby said. Modernization efforts to support Operations Iraqi Freedom, New Dawn, and Enduring Freedom had increased the aviation acquisition budget to about $8 billion to support overseas contingency operations. “With our current budget climate, it is going to be difficult to maintain what we have,” Crosby said. In order to remain relevant in the eyes of the ground commander, the Army must continue to train as it fights. “We are their critical enablers in the battlefield, and we will break that bond if we don’t train together, and if we’re not able to support them at the level they need when they call on us,” Crosby said. He said the Army’s natural tendency, with a declining budget, is to focus on individual training. “We have the best individual training in the world,” he said. But the Army does not do as well in collective training. So what does this mean for the Army aviation community? “We must find ways to reduce sustainment costs and to increase the efficiency with our training devices,” Crosby said. These include devices such as flight simulators that more realistically simulate flight training at the proficiency levels aviators need. “We can maintain proficiency with less flight hours, so that the flights hours that we do have, we could be doing the collective training with our brothers on the ground,” he said. Other challenges, Crosby emphasized, are modernization programs that Army aviation needs to insert in a decreased budget climate. “Every one of our aircraft is approaching 50 years old, or close to 50,” Crosby said. The CH-47 Chinook, OH-58 Kiowa Warrior, AH-64 Apache and UH-60 Black Hawk are the Army’s main aviation platforms. The only new aviation assets the Army is purchasing are unmanned aircraft systems. “As we look to the future, we’re going to need some new system,” Crosby said. 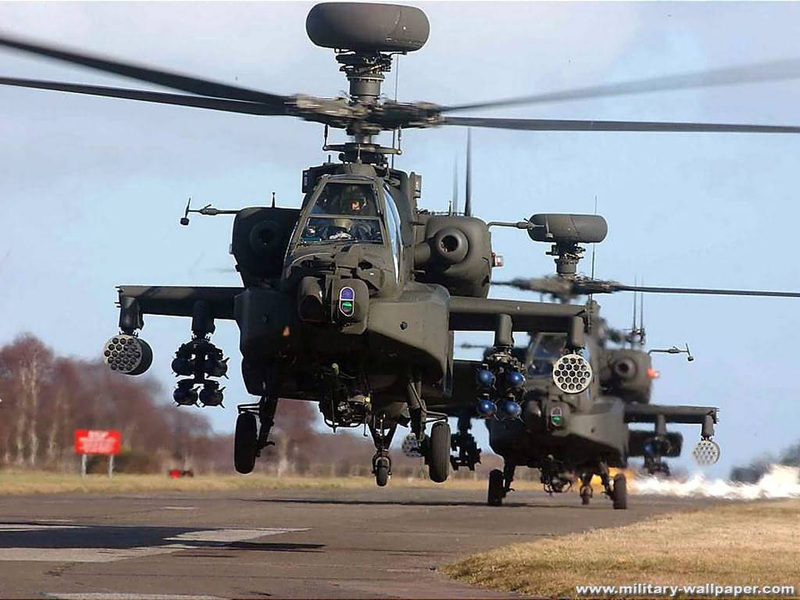 Citing the impressive Army aviation assets that supported Operations Desert Shield and Desert Storm, Crosby said, had someone not had the vision to see Army aviation’s future, the Army would have been fighting the Iraq war in the early 1990s with UH-1 Hueys and AH-1G Cobras. “We have to look at the next technology. Identify what is that next capability, and we have to be willing to trade requirements,” he said. Crosby emphasized that with today’s resource constraints, the Army must be willing to trade with what is available in technology, what is affordable, so that the acquisition community can “feed substantiated information” to the requirements leaders at Fort Rucker, and together, make equitable trades. Because 75 percent of the aviation fleet is in utility and attack, the focus of the Future Vertical Lift will be to resource that combined variant in the FVL fleet. The FVL concept is to create a new rotorcraft that uses new technology, materials, and designs that are quicker, have further range, better payload, are more reliable, easier to maintain and operate, have lower operating costs and can reduce logistical footprints. “We want to increase the range, increase the payload, operate in high/hot, and increase our airspeed,” Crosby said. Crosby also discussed other modernization efforts such as the Improved Turbine Engine Program, which is being developed as the next generation engine for utility and attack helicopters. The ITEP will provide significantly increased operational capability, fuel efficiency, range and payload to meet Army mission requirements, including operations in high/hot environments, and lowers maintenance actions for the utility and attack variants of the Army’s helicopter fleet. Combating Degraded Visual Environment in rotary wing aircraft does not pose as much of a challenge with newer platforms such as the UH-60M, AH-64E, and CH-47F, but it presents a big challenge with analog platforms, Crosby said. Digitized platforms are easier to improve upon because much of that is software development and software improvement. One of PEO Aviation’s primary efforts is to modernize the UH-60L, taking existing airframes that have analog cockpits and updating them with digitized cockpits. The real goal, based on the Army’s requirements, is to make the L as similar to the M model as possible, so that when an aviator steps into an M model or an L model digital, he or she sees the same cockpit in terms of graphics and digitized capability. The pilot may not necessarily see the same box that displays the graphics, but it will look and operate exactly the same. “We also need a new training helicopter. If we lose one in flight school, we can’t use that because we don’t build one anymore,” Crosby said. Injecting these modernization programs in a declining budget will be difficult, and Army aviation will have its share of challenges, he said. The natural tendency, as the Army faces budget down turns, force structure changes, and sequestration, is for everyone to put their silos and guards up, he said. Crosby challenged industry members to think strategically, to look at the long-term goals and the implications to government and industry if they don’t work together. His biggest concern, are the potential implications to the third and fourth tier vendors. “The big industry leaders will survive this,” he said. “The third and fourth tier vendors will struggle much more. He gave the example of the recent signing of the CH-47F multi-year two production contract, which brought the American taxpayers more than $810 million in cost savings, and put stability in the industrial sector for the next five years. Success can be achieved when industry and government entities partner as one team to achieve quality and affordability goals. “I believe we’ll all get through this if we work together,” Crosby said. At the end of the breakfast, Kris McBride, newly inducted president for the local AUSA chapter, thanked Crosby for speaking with AUSA members and for answering all their questions. She presented him with a book titled “U.S. Army Aircraft Since 1947: An Illustrated Reference” that will be donated to the Post Library in Crosby’s honor. AgustaWestland is pleased to announce that the first ICH-47F Chinook for the Italian Army successfully accomplished its maiden flight on June 24th at Vergiate in Italy. The aircraft took to the air for 15 minutes, performing as expected whilst carrying out basic handling tests and main systems checks. This ICH-47F Chinook is the first of an order for 16 units plus four options placed by the Italian MoD Procurement Agency (ARMAEREO). The contract also includes a five year logistic support service. The delivery of the first aircraft is planned in early 2014 with final deliveries in 2017. The ICH-47Fs will be operated by the Italian Army Aviation 1st Regiment “Antares” based in Viterbo and they will replace the 40 CH-47C Chinooks that have been in service since 1973. Under a Joint Industrial Agreement with Boeing, AgustaWestland is prime contractor for the Italian ICH-47F program, with responsibility for systems integration, final assembly and aircraft delivery to the Italian Army. In addition AgustaWestland is also being qualified by Boeing to produce the entire drive systems. Boeing Rotorcraft Systems builds the fuselage at its Ridley Park, PA, facility in the United States of America whilst final assembly is carried out at AgustaWestland’s Vergiate plant in Northern Italy. The ICH-47F customized version incorporates a secure communications system, self-protection system and advanced datalink system. This new ICH-47F Chinook variant has a Maximum All Up Weight (MAUW) of 23 tons, is equipped with two Honeywell T55-GA-714A engines giving it excellent “hot and high” capability and is suitable for all weather operations. The primary tactical mission of the ICH-47F aircraft is to provide air transportation for equipment and troops. Cargo can be carried internally and externally using the aircraft’s cargo hook system. The helicopter’s payload, long range and high cruise speed make it a unique asset to meet the Italian Army’s needs and can additionally perform special support functions, disaster relief and firefighting roles. The Joint Industrial Agreement between AgustaWestland and Boeing also includes a licensing arrangement that enables AgustaWestland to market, sell and produce these “Chinooks” for other countries. Satellite imagery has revealed new tunneling work at North Korea’s nuclear test site, but nothing that points to an imminent detonation, a US research institute said Wednesday. The activity appears to have begun in late April — at the height of a recent surge in inter-Korean tensions — and gathered momentum over the next few months, the US-Korea Institute at Johns Hopkins University posted on its 38 North web site. The tunneling at the Punggye-ri nuclear test site — evidenced by a large new dump site — was taking place near the West Portal where the North’s 2009 and possibly 2013 nuclear tests took place. The purpose of the work was either to construct a new test tunnel that would take several years, or to repair or clean out an existing tunnel, the closely-followed website concluded. “These activities do not appear to be part of preparations for a nuclear test in the near-term,” it said. “Rather, they seem to be long-term projects — a conclusion reinforced by the presence of installed cart rails — that may be necessary for the conduct of future tests,” it added. North Korea conducted its third and most powerful nuclear test at the Punggye-ri site in February this year. North Korea said the test was of a miniaturized device, and hinted that the fissile material involved may have been uranium, as opposed to the plutonium used in its two previous tests in 2006 and 2009. Pyongyang has made it clear that it plans to conduct further tests sometime in the future. The February detonation triggered tightened UN sanctions and a cycle of escalating military tensions on the Korean peninsula that lasted for two months.